I am well overdue for a new post - so its finally here! The problem is I have been so busy the last few weeks I haven't spent much time sitting in front of the computer. Most of the reason for this is skiing. Skiing seems to take up a fair bit of my time right now - skiing in various different forms, partly in preparation for our upcoming 'big event' - the world ski orienteering in Sweden in two weeks time. But it hasn't all been serious training (-: We spent the winter holidays in France, in the very over tourist populated but none-the-less beautiful town of Chamonix. On the Wednesday of our trip we got some horrible news - Christchurch (our home town in New Zealand) had been hit by another big earthquake, large parts of the city had fallen down and many people had lost their lives. It was awful to be stuck on the other side of the world not able to help out - and I felt bad about us continuing to have such a great time in France. Fortunately no one we know was hurt, but both our families homes were badly damaged. I wondered if I should publish this post - but I had some requests from people in Christchurch who want to read about something fun to take their minds of aftershocks, cracked walls and broken crockery - so here we go. Chris's Mum's kitchen isn't looking quite as organised as last time I saw it! We flew to Geneve on Saturday with Tim and took a minivan Chamonix - about a 1.5 hour drive, but it took even longer because there was so much traffic - this was the first warning sign. We made it to our little rented apartment in central Chamonix, then headed out for our first French dinner, yum yum! I had a delicious thing called a 'croute savoyard' and red wine followed by lemon crepe, mmmmm. We discovered we even had our very own little 'telepherique' in our apartment! The next day we set out on our first 'orientation' of the ski areas. With the 'Mt Blanc' unlimited ski pass we had access to 4 areas around Chamonix plus the Courmeyer ski area in Italy through the Mt Blanc tunnel. The buses were totally packed as we got our first taste of the Chamonix sardine feeling, then we queued for our lift passes, then queued for the telepherique, and 'sardined' our way up to 2 700m! We could notice the altitude on our descent from the gondola on Grand Montet. Unfortunately it was very cloudy and visibility was really bad. We still had a fun day getting used to huge descents and yummy cheesy lunch at a wee restaurant on the slopes. The piste was pretty icy, but off piste you couldn't see a thing, so it was best to compromise by going between the two. That night Helen and Ally arrived from their friend's wedding in Switzerland. We cooked dinner together and shared stories as well as planing our strategic 'attack' of the ski areas over the coming week. We wanted to get the best value possible out of our pricey ski passes. Snow conditions for the week were not looking so good - there had been a small amount of snow fall the day before, but that was the first in weeks and there was no more predicted. So much for powder in the alps! The following day we spent the morning playing in the trees at Le Tour, before giving up in average snow there and sardining our way up to the very top of Grand Montet. At about 3300m the view from the top out over the alps is amazing, and it had finally cleared so we had sun. We carefully skied down the glacial part, past some great yawning crevasses, then on down the massive descent all the way to the valley floor,the whole run took us two ours and it was great! The clouds finally cleared on Monday and we got to see this! We had a disappointing meal at a English pub that night and decided to stick to the Frenchy places from then on. It was in the morning that we learned the sad news about the Christchurch earthquake, so we ended up setting out later for our skiing than planned, and the day passed with a slightly surreal feeling. Helen headed over to Spain and Portugal for her orienteering training camp in nice warm temperatures while we kept on skiing. The weather for the following day was supposed to be really good, so we decided to take on the Aguile du Midi and ski down the famous Vallee Blanche. Fortunately we certainly weren't the only ones, so we could follow in the safer tracks of the many big guided groups in front of us (thus hopefully reducing likelihood of falling in a crevasse). It was awesome being up so high (3800m) I think, and we carefully descended our was from the top of the telepherique and onto the glacier. From there we followed across the gentle slopes, before dropping more steeply down to the hut halfway down the glacier. Chris and I actually walked down the glacier a few years earlier after one of Chris's adventure races - but then it was summer and the glacier was even more broken up than now. The surrounding peaks sparkled, revealing their icy slopes in the afternoon sun. We sped down the last part of the glacier, Ally getting some assisted towing by Chris on his snow board which doesn't slide on the flat as much as skis and you don't have any poles! Feeling sweaty, but pleased with ourselves, we took the cog railway back down into Chamonix. In the afternoon we managed to squeeze in time for another trip to the very top of Grand Montet- that was just two ski runs in one day! We repeated a nice dose of yummy apple cake consumed at the very summit of Grand Montet which we had discovered the day before. On Thursday we awoke to a sprinkling of fresh snow on our skylight, and after some deliberation the night before we had decided to attempt a trip over to Courmeyer in Italy through the Mt Blanc tunnel. The problem was we had tried call the bus company to book a spot the night before, but we were told the bus was full and there was no chance of a ride - even though this bus trip was supposed to be part of our 'all mountain' ski pass. We arrived at the bus stop and Chris managed to charm the lady into getting us spots on the second bus, so after a nice cafe au lait in the little cafe nearby we were off to Italy. Courmeyer was great, it was still cloudy, but the slopes were much quieter and the fresh powder made it really nice! We took a cable car up high on the mountain and did a big and quite steep descent way back down the the valley. The temperature down in the valley was really nice and the sun had just emerged, so we had a little picnic in there, before skating back out along a road and up a chairlift onto the ski area again. The rest of the day was spent skiing in the powder amongst the trees. At 4 we headed to a little after-ski halfway up the ski field and tried what all the Italians were drinking - some strange pink 'spritze' drinks, which made the long descent back down into Courmeyer a little more entertaining. In Courmeyer we ate very average pizza, then bused back into Chamonix after a great day skiing in Italy. It was so good in fact we decided it was the best pick for the next day as well. We repeated our technique with the buses successfully, and soon we were squiged onto the telepherique and heading up to the highest point on the field, the Cresta D'Arp (2755m). We had a wonderful view from the top, and we studied in detail the famous Helbronner descent on the other side of the valley. The only descents from D'Arp are quite exposed and all off piste, so we took our time and carefully descended above some cliffs, then enjoyed some powdery turns till we were back in the steep gully we descended the day before into the valley. We skiied out from there and plonked ourselves at a outside restaurant in the sun to try our luck with Italian pizza again. This time we did better, particularly with the 'petit Mt Blanc' pizza which consisted of pear and blue cheese! We spent the afternoon doing some more tree bashing, then took a slightly earlier bus back to Chamonix than the previous day. We had the best meal of the week at the Omletterier (-: (Ally had been reluctant to try it earlier - but I knew it would be good). After that we agreed to visit the after ski Chambre Neu which Ally had been hankering after all week - it was a nice place to hang out. Saturday was our last day, and we decided to try Les Houches, seeing as it was the one area we hadn't been to all week. It is lower than the other areas, and the snow was very patchy turning to grass in lots of places. So it was pretty average skiing, but it was entertaining nonetheless. Ally got to try a few rail slides in the snow park. Chris, Tim and I took the bus back to Geneve so we could fly out from there on Sunday, while Ally took the overnight train to Paris, so he could try out some crazy caving in the underground tunnels of Paris with his friend! We arrived back in Trondheim on Sunday night after a great week in the alps - maybe not the best snow ever - but we still enjoyed ourselves. The gang and Italian 'Spritze's' in the sun! Wicked photos! Love how you've dropped in the food reviews. When will Em's food & gear review finally be commissioned? So much skiing!So much time spent in the snow!So much yummy French and Italian food! 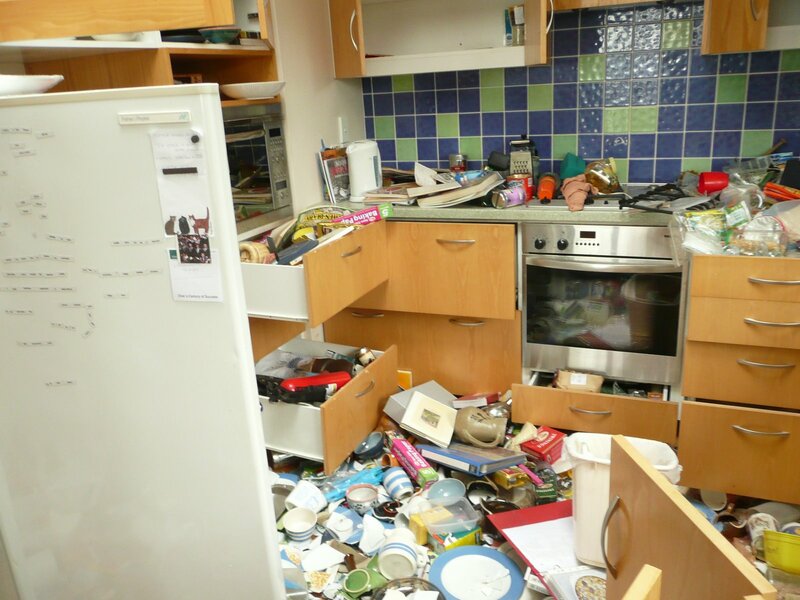 Anne has tidied up her kitchen! You can come back! Thanks for the updates, guys! Glad to hear your families are okay. Always nice to see your amazing photos. Wow - awesome pics! Looks amazing! You sure are getting a lot of skiing in :) Congrats also on the Ski-O champs despite the white-out!